Ask any of the 16 million travelers who visited Paris, France’s capital, in 2017 and they’ll quickly agree that resisting the charms of the City of Light is utterly impossible. Paris is historical, big, beautiful, stunning, culturally rich, but sometimes a very nerve-wracking city. 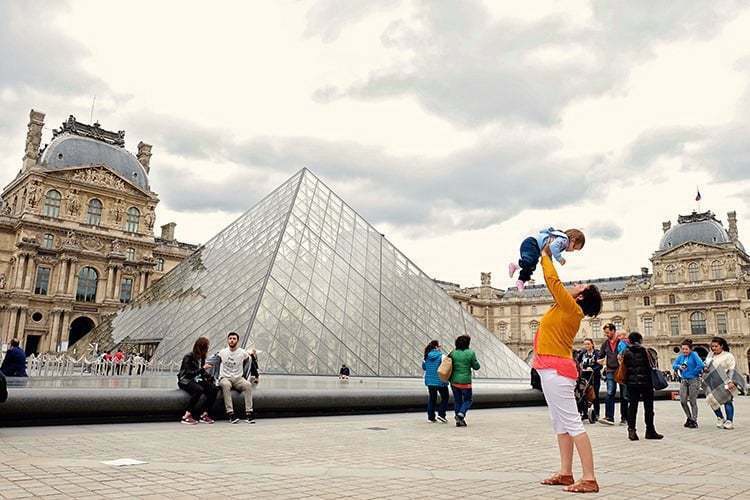 Believe it or not, Paris isn’t the most baby-friendly destination. 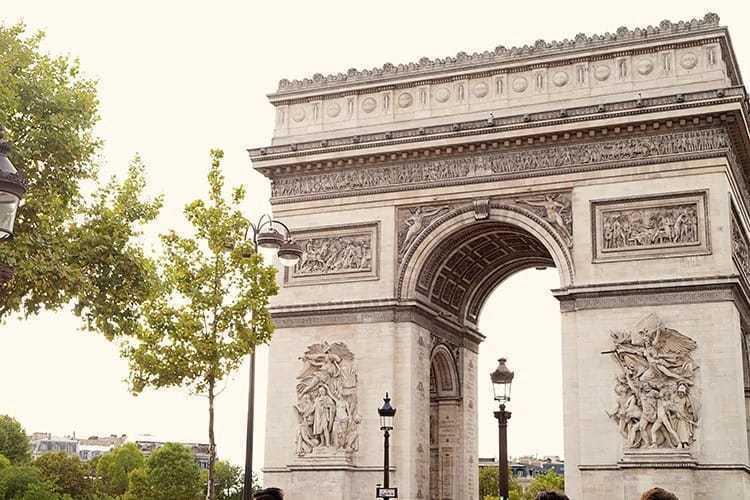 Even though Parisians or the French, in general, tend to take a laissez-faire attitude towards a lot of things including public display of affection and art, they are a little stricter with kids in comparison to other countries. 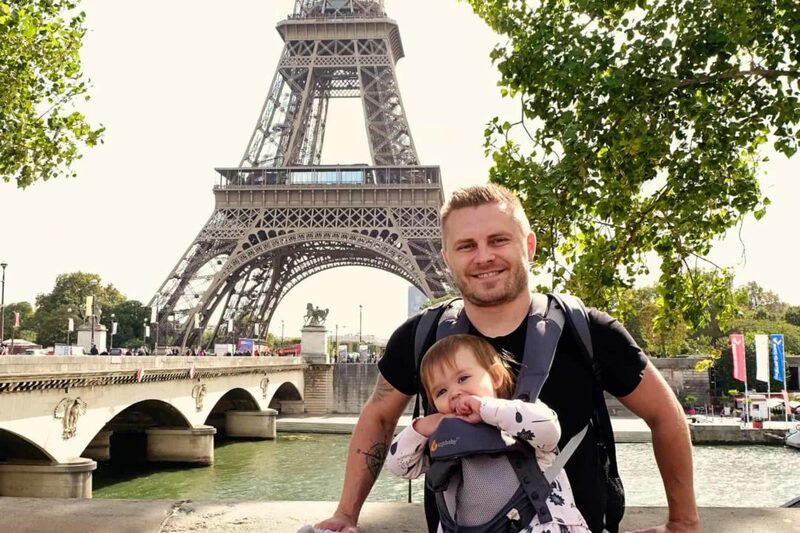 However, this isn’t to say that you cannot travel to the magnificent Paris with your lovely baby or toddler, but it would be best if you are prepared and if you know what you can expect from your trip. 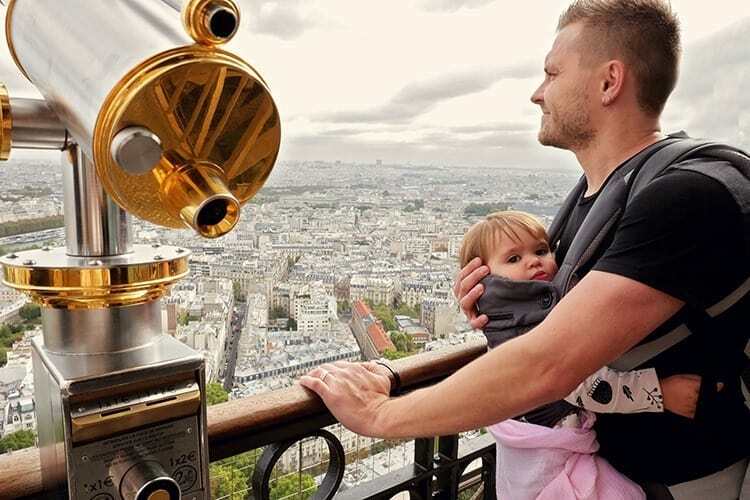 In our Paris baby travel guide, we outline which baby items are essential to bring along, ideas of where to book your accommodation, how to see the most popular sights with your baby, as well as what to expect in general. 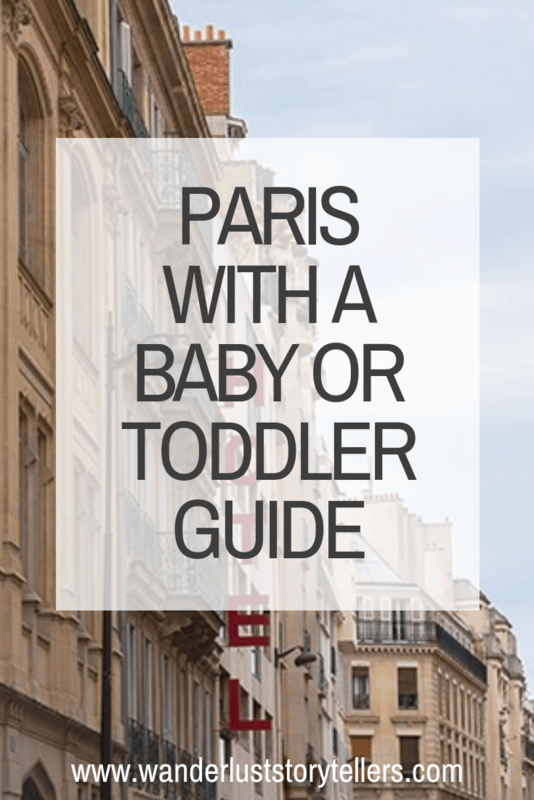 We share our top tips on how to visit Paris with a baby. 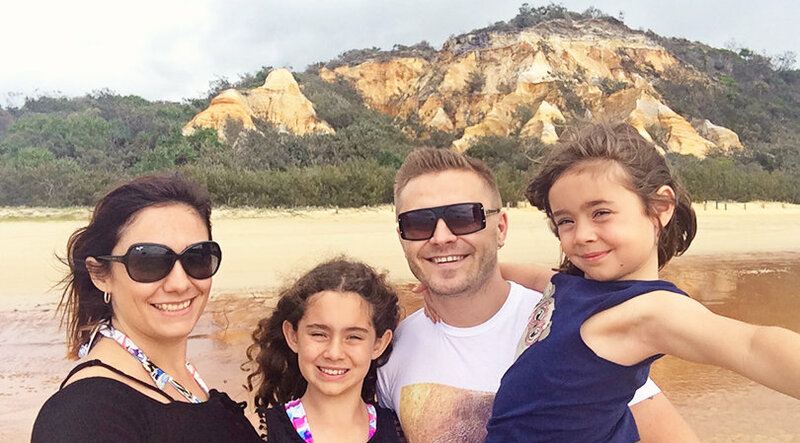 After more ideas of where to go with your little one? Here is our guide to the best places to vacation with a baby. Here are a few things that would be of much help if you bring with you to Paris. 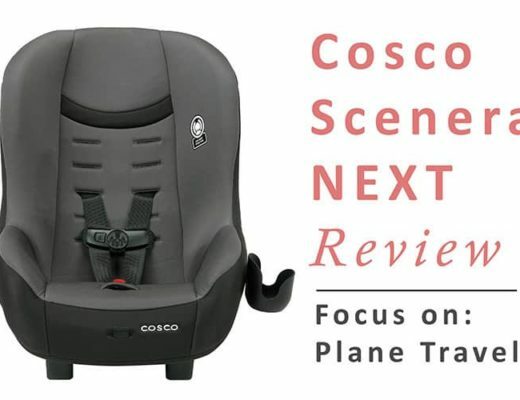 You can also browse our list our personal favorite baby travel items here. Do make sure that you read our helpful general travel with a baby guide as well, especially if this is your first trip with your baby. It is very rare to find high chairs in restaurants in Paris. 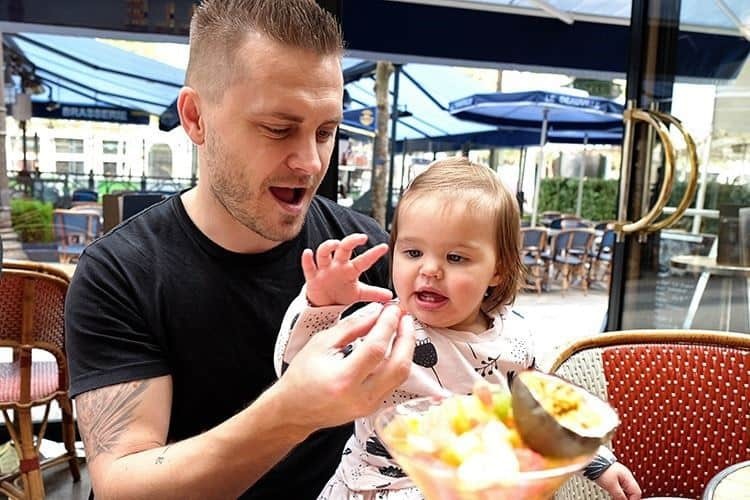 Whilst we didn’t bother to take a high chair, if you prefer to not balance your baby on your knee whilst you eat, we do suggest you pack in a portable high chair to make life easier. 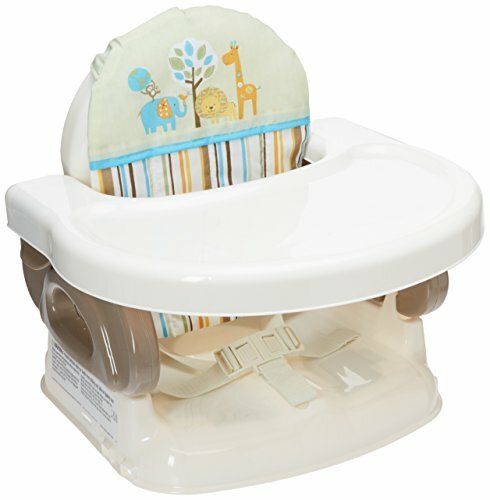 Click here to browse through our favorite high chairs for travel. It’s advisable that you leave your baby’s big American-style stroller at home. 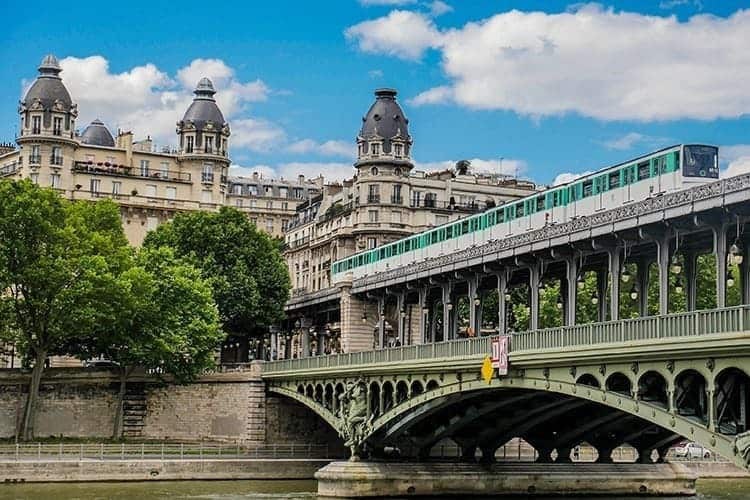 You can imagine how extremely hectic it would be to navigate the narrow and busy streets of Paris, not even too mention having to squeeze past the masses at the tourist attractions. Not only will this save you from lots of unsympathetic evil stares and huffs, but it will also be crucial in preventing you from repeatedly nudging into Parisians and having to constantly say: “Pardonnez-moi!” (Pardon me). You should, therefore, consider a lightweight umbrella stroller, which you can easily fold in crowded streets, on the metro or the bus. 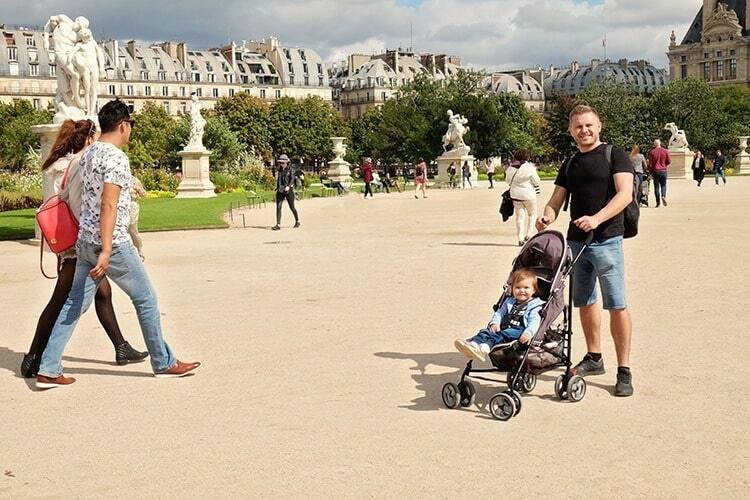 We used our stroller whilst visiting sites such as the Louvre, the Notre Dame Cathedral as well as for a day walk down Avenue des Champs-Élysées and Jardin des Tuileries. Baby carriers are essential for days when you will be making use of the metro a lot. 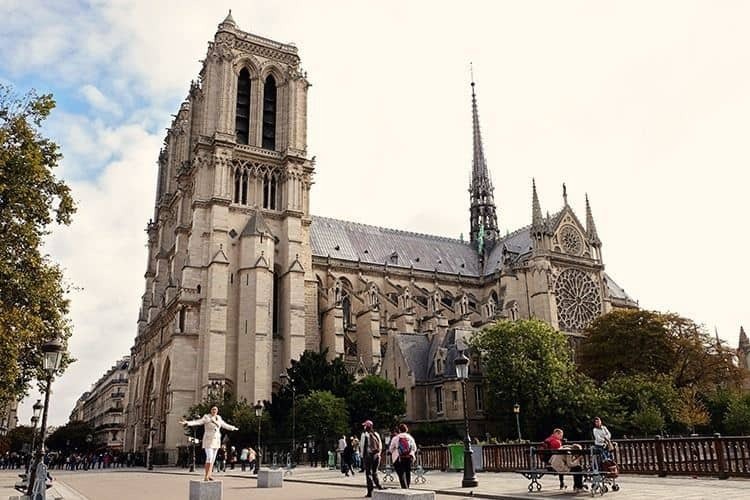 It is also essential for the day when you visit the Eiffel Tower, or if you plan to climb the Arc de Triomphe to get a beautiful view over the city. Click here to see prices for the Ergo Baby Carrier that we use when we travel. We also use a backpack diaper bag, which helps to balance out the weight of the baby on the front. You can see a list of the brands of backpack diaper bags that we recommend for travel here. Changing tables are a rarity in the City of Love, so don’t even expect to come across one. Apart from at the airport and in large department stores, you’ll never find any changing table. This may mean that you have to change your baby in some pretty random spots, so make sure you always have some disposable changing pads on hand. Click here to grab some disposable changing mats. Baby’Tems basically rent out everything related to babies and have them delivered to your hotel or apartment in Paris. Their rates may not be so cheap, but they’ll be helpful and save you from a lot of headaches. Finding a baby-friendly hotel in Paris is certainly not an easy endeavor. While some may have a bathtub for bathing the baby, as well as baby cots, most of them are small and lack most of these amenities. So before booking, it’s important to check things such as on-site amenities, room sizes, cot-availability, and ambiance. Here is a handy guide to help you find a suitable travel crib to take along on your trip. Try to pick a hotel that is in close proximity to the main attractions that you would like to see. Here is a handy guide to the best arrondissements to stay in. You should also keep in mind that elevators in hotels are not quite common in Paris. As always, it’s important to check first before booking or at the very least request a lower-level hotel room. 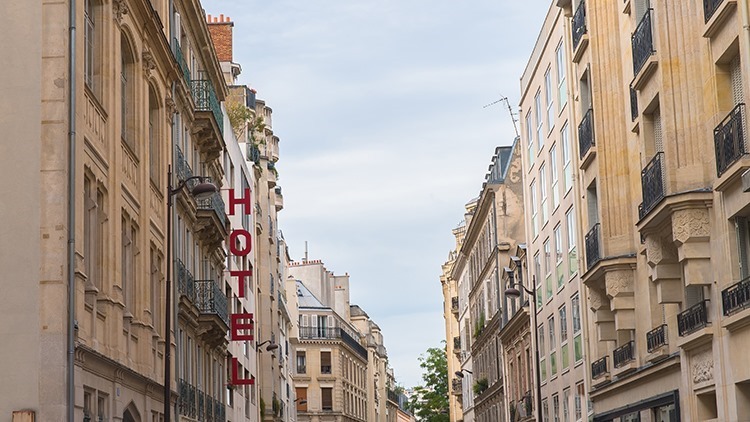 Cities in Europe traditionally have small hotel rooms and the same applies to Paris. In fact, they’re extremely small in Paris! Many hotel rooms are so small that you may be left with no room to move, let alone an appropriate space for the baby to crawl and stretch his legs and especially if you added a baby crib; which is why we prefer to book an Airbnb apartment for our visit instead. If you’re planning to stay in Paris with kids or a baby, for more than three days, it would be advisable that you rent an apartment. They’re often cheaper than hotels and will give you more space for you and the baby. You’ll have access to a kitchen, fridge and even more importantly, a washing machine. You’ll also likely have access to free Wi-Fi and might perhaps have baby items included (in fact all the ones we booked throughout France gave us a baby cot – at an extra expense), let alone the fact that it will likely be located in a more authentic Parisian suburb. A good way of booking this type on an apartment is through Airbnb. If you don’t have an account with Airbnb yet, sign up with this link and you will get US$25 off your first booking. If you, however, have your mind set on booking a hotel room, it’s only advisable that you go for baby-friendly hotels. There’s no doubt that finding a hotel in Paris that will make you and the baby feel welcome, well-cared-for and safe is quite a challenge. Use this link for booking.com to receive a small discount for your stay. You will receive a credit after you complete your stay, not before! Still handy though! 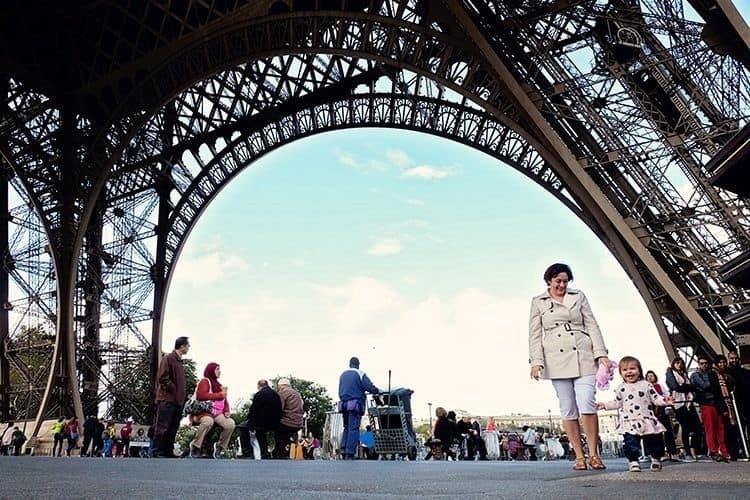 There’s no doubt that Paris is one of those few cities in the world that are best seen and enjoyed by foot. 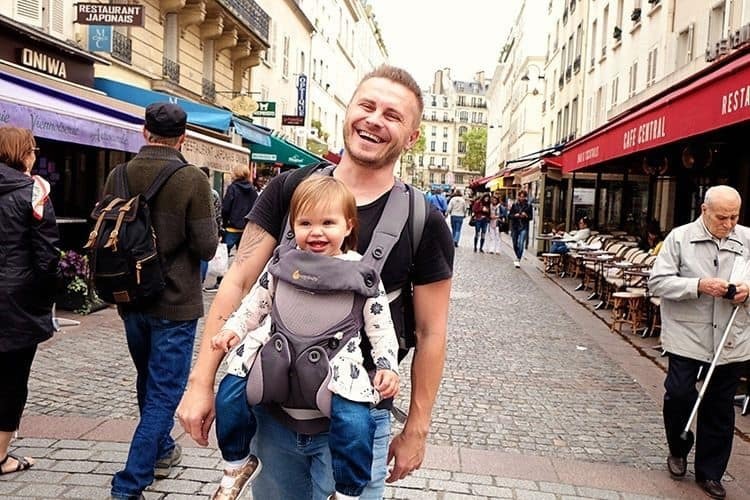 And if you are perhaps visiting Paris with kids that are a bit older, I’m sure that you will probably make the most out of being able to walk around. But because you’re traveling to Paris with a baby, you might also need other modes of transport. Riding the Metro is certainly the quickest and easiest way to get around. Tickets are readily available at the machine in each station. You'll, however, need to download the map of the Parisian Metro system on your phone to make things a little easier. 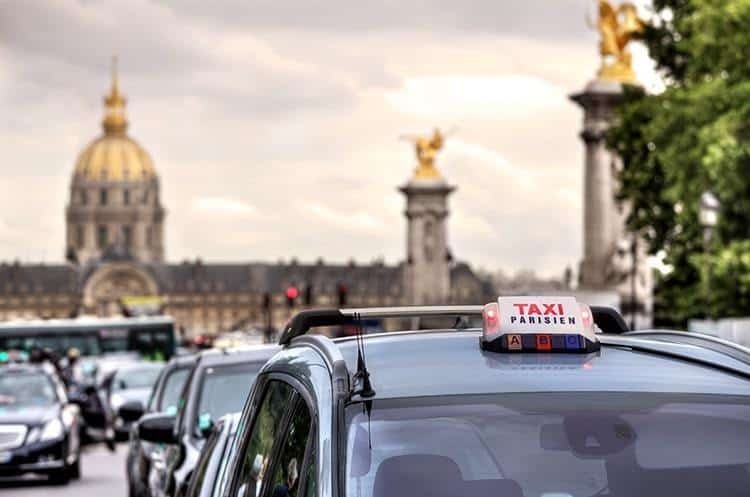 Taxis are also readily available all over the city and you can book them in advance through online platforms such as Taxis Bleus or G7. Uber services are also available, as well as Women Drive, but this is exclusively meant for women. 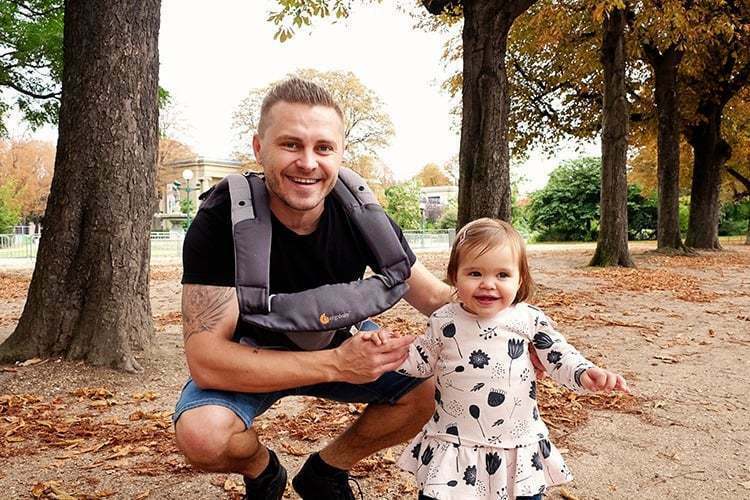 It’s important to note that a baby car seat isn’t a must in taxis, but are a must in personal vehicles so you should make plans and get one if you’re going to hire a car. Buses are another better way of getting around Paris. 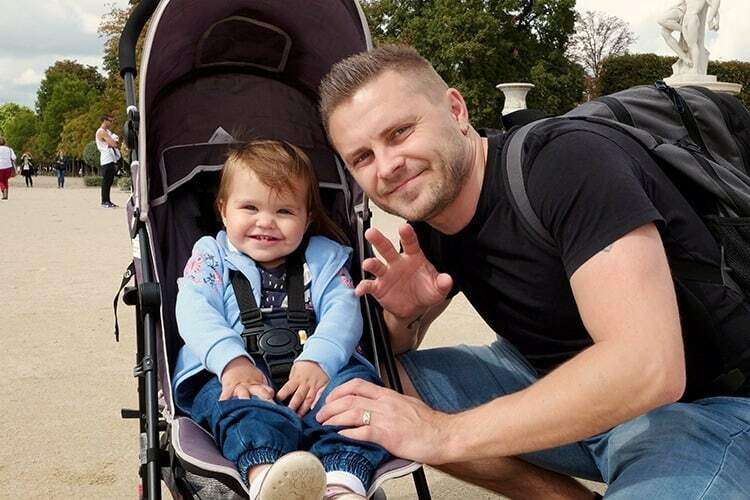 Taking a bus is actually easier than taking Metro as you’ll be allowed to roll in your stroller and so you should consider them, especially if you are hell-bent on carrying a stroller. You can also book your airport transfer ahead of time, check out websites such as this one here. High chairs for babies in Parisian restaurants are very rare! This is where your portable high chair comes in handy. We also found that many restaurants were way too small for strollers. And often when our baby was cranky in the restaurant we felt that we have eyes of judgment on us from the customers around us. 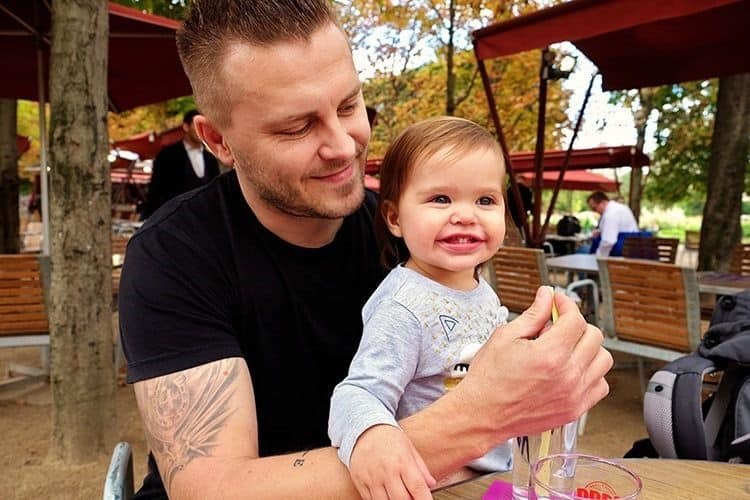 The biggest challenge is that restaurants in Paris only serve dinner from 7:00 – 7:30 pm onwards which is past our baby’s bedtime, so she spent many cranky nights in restaurants, which made dinner-time pretty stressful for us. Many people think that you should skip the Louvre if you have kids. But I disagree. What I do suggest though is that you have a plan of action of what you want to see. We mainly wanted to see the Mona Lisa. If you ask for directions you can see this famous painting quickly and easily. As our little one had fallen asleep we kept browsing sections of the museum that we were interested in and when she woke up we left. 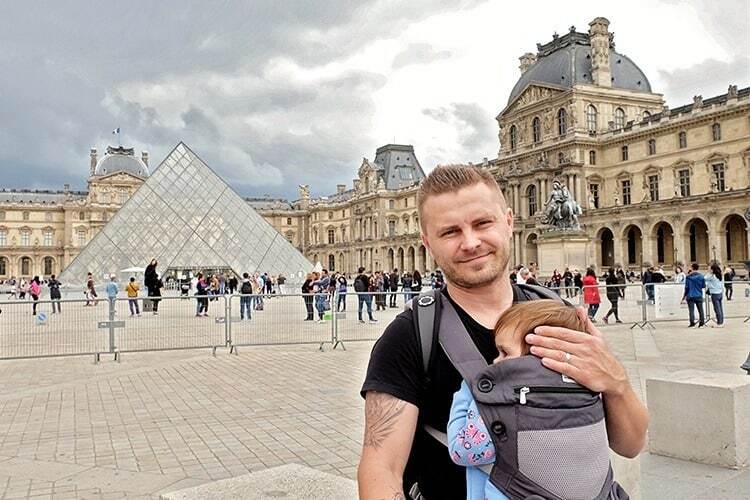 We visited the Louvre during shoulder season and we used a stroller. They have a lift that goes down to the museum from the main entrance. We could skip the general queue and use the queue for the lift instead. If you are visiting during high season, I would expect that it would be easier to use a baby carrier as it would be tricky to navigate the museum with all the crowds. You have a choice of either taking the stairs or the lift to the viewing platforms of the Eiffel Tower. We highly suggest you take the lift. In an attempt to skip the long queues we highly suggest you buy your tickets online via the website. You need to do this early as they only release a set number of online tickets and they can sell our fast. It is essential to bring your carrier for the day because you will find that space is very very limited on the platforms and in the lifts. Champ de Mars was closed on our visit, but usually, this park is a great place to let your little one ‘loose’ for a little while. If you are travelling with a toddler, you can also head over to the old carousels opposite the street. The Arc de Triomphe is definitely worth a visit as it offers beautiful views of the Eiffel Tower, the Champs Elysees, and the rest of Paris. In order to get there, you will need to take the metro, walk downstairs and cross the street via an underground tunnel. o get to the top of the viewing platform you will need to climb 284 steps. Which is why we highly recommend a baby carrier for this part of your trip. However, if you do happen to have a stroller you can leave it with on the bottom level. The Cathedral is open from 8 am to 6:45 pm Monday to Friday, 8 am to 7:15 pm Saturday and Sunday. You will pretty much always find long queues at the cathedral due to the baggage security checks. The queues move fast, but as a tip – we simply asked at the gate if we could skip the queue as we had a baby with us and they let us in. You can easily use a stroller at the Cathedral. If you do want to climb the stairs to the tower, then we suggest you stick to a carrier. Further Reading: If you have older kids, you can grab some great tips for your family trip by clicking here. One of the most memorable things you can do in Paris is to organize a little family photoshoot to record your trip. 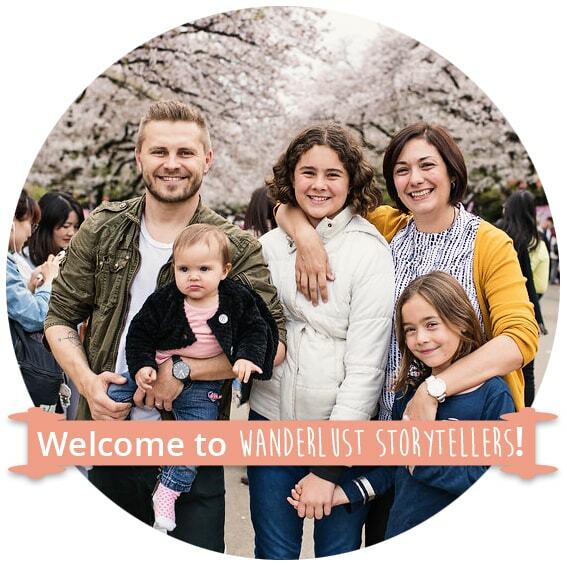 We use Wanderloud for our destination shoots. They are wonderful and I always love their photos! We actually had them booked in for a family shoot at the Eiffel Tower, but our luggage was delayed for 4 days and ended up canceling as we had to wait for the luggage to be delivered! It is an awesome experience and it is so much fun to have someone grab photos of the entire family. If you are interested you can check out their fabulous and affordable destination packages here. Ah, Paris is undoubtedly the romance capital of the world! It’s a land of endless sumptuous cuisines, top-notch weather, and world-class cheese, as well as free-flowing wine and legendary art. Paris is a city where lovers are free to express their love to each other openly in parks or in restaurants at any time of the day or night. It’s one of world’s most fabulous destinations. On one hand, Paris may seem like a nice place with kids. There are parks everywhere with some even tucked alongside some of the busiest streets. On the other hand, without the ease of access to high chairs, baby rooms, change tables and sometimes even baby cots, this city can be a bit challenging for parents. So if you are planning to go to Paris with a baby, follow the above tips to help make your trip just that bit easier. 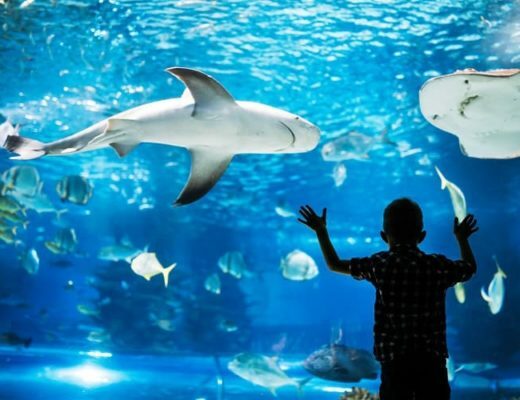 5 Surprising U.S. Cities to Visit with Kids!